In this ebook, you’ll learn three straightforward, science-based, and actionable strategies for rewiring your brain to be more grateful – and happier and productive, too. This ebook was written by Scott Crabtree, Happy Brain Science’s founder and Chief Happiness Officer. The ebook was written just before Thanksgiving of 2012, about a year after he had left Intel to start pursuing his passion for sharing the science of happiness at work full time. 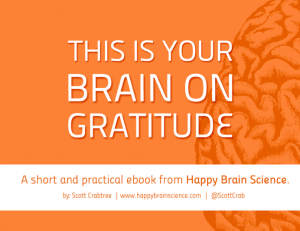 Scott wrote this ebook not only to share about gratitude, but to show his gratitude to all who supported him on this new endeavor; whether it was through attendance at one of his workshops, a subscription to the Happy Brain Science newsletter, retweeting him, working with him, giving feedback, mentioning Happy Brain Science to a coworker, or checking out Happy Brain Science’s website or Facebook page. We hope you will enjoy the read, and, more importantly, act on one or more of the ideas. If you find this ebook helpful and interesting, please share it with your community via email or social media.